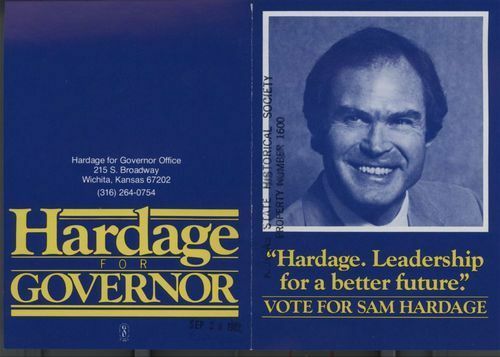 This 1982 political campaign brochure advocates Sam Hardage as the Republican candidate for Kansas Governor. The brochure argues that Hardage used his leadership abilities to succeed in business and when elected governor he would do the same. Hardage organized the "Kansas 2000 Commission," an advisory group of Kansas leaders in business, education, and agriculture. Democratic incumbent Governor John Carlin defeated Hardage in the November general election.